What is the Rolex Day-Date Masterpiece Watch? 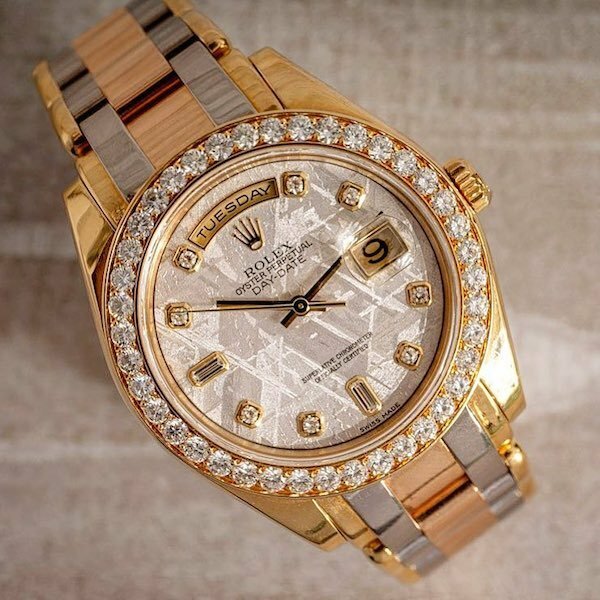 Home » Watches » What is the Rolex Day-Date Masterpiece Watch? What do you get if you cross a Day-Date with a Pearlmaster bracelet? A special edition Rolex Masterpiece watch! Never heard of this particular Rolex model? Then read on to find out what exactly is the Rolex Day-Date Masterpiece watch. In order to figure out how the Rolex Day-Date Masterpiece came to be, we have to look back at the company’s history a little bit. In 1992, Rolex unveiled a new watch model called the Pearlmaster. The Pearlmaster was positioned as Rolex’s jewelry watch collection, always fashioned from precious metals and always embellished with diamonds. The signature design trait of the Rolex Pearlmaster is its bracelet–aptly called the Pearlmaster bracelet. The Pearlmaster bracelet is a five-piece links bracelet fitted with a concealed Crownclasp. It is curvier than the Oyster bracelet yet flatter than the Jubilee or President bracelet. 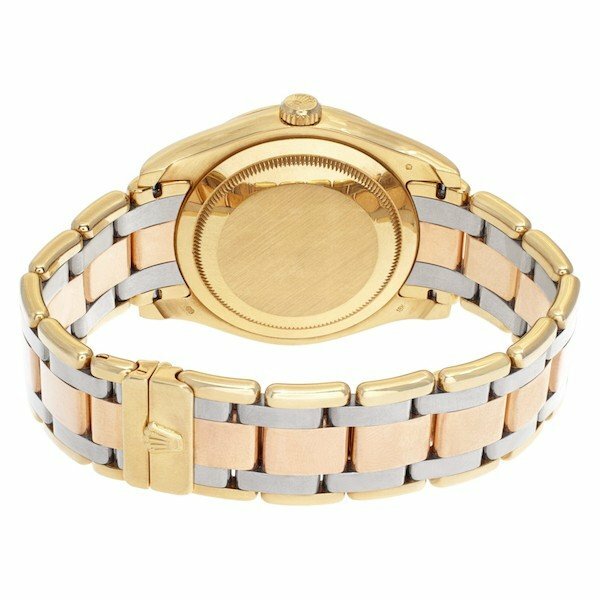 Originally, Rolex only paired the Pearlmaster bracelet with Lady-Datejust watches to created spectacular gold and or platinum diamond Rolex watches for women. However, in the 2000s, Rolex unveiled new special-edition Day-Date watches fitted with Pearlmaster bracelets called the Rolex Masterpiece. One of the first things you’ll notice about the Rolex Masterpiece is that its case is larger than the classic Day-Date watches. Rolex Day-Date watches aka the Rolex President traditionally sported 36 mm cases (until the introduction of the 41 mm Day-Date II in 2008 and the Day-Date 40 in 2015). The Day-Date Masterpiece, on the other hand, flaunted a larger 39mm case–making it a great option for those who wanted a bigger Rolex President. The dial, of course, retains the characteristic duo of calendar windows to indicate the day of the week and the day of the month. But as mentioned, rather than the iconic President bracelet, the Day-Date Masterpiece is fitted with a Pearlmaster bracelet. Both the Pearlmaster and Day-Date are exclusively made in precious metals, so it comes as no surprise that the Day-Date Masterpiece is also only available in gold or platinum. What’s more, there are plenty of ultra lavish versions such as Tridor models that mix three shades of gold and platinum editions complete with baguette-cut diamonds on the bracelet. A particularly striking version of this special-edition Rolex is the Tridor Day-Date Masterpiece 18948. 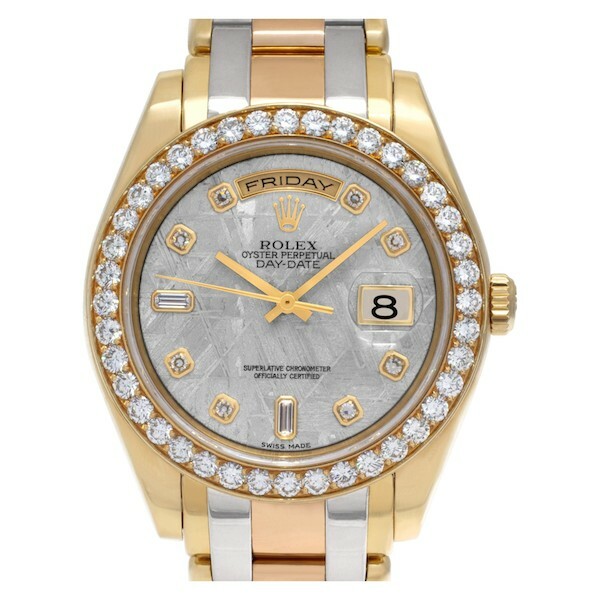 First, we have the 18k yellow gold 39 mm Oyster case, which is topped with a Rolex factory diamond-set bezel. There are a total of 40 round-cut diamonds on the bezel of this Masterpiece ref. 18948. Furthermore, there’s the spectacular meteorite dial with its distinct Widmanstätten check-like pattern and color. Cut from the famed Gibeon meteorite that fell in prehistoric times in Namibia, Rolex has furnished some of their watches with meteorite dials. This particular Rolex meteorite dial is home to 10 diamond hour markers, including two baguette-cut diamonds. Last, but certainly not least, is the Tridor Pearlmaster bracelet, which marries three shades of 18k gold–yellow, white, and rose. If you’re looking for a show-stopping Rolex watch that not many people can claim to own, this is it. Rolex no longer makes the Day-Date Masterpiece watch having discontinued it a few years back. And since Rolex Masterpiece models were produced in such limited quantities and for a short amount of time, they are not frequently spotted out in the wild. Rare, lavish, and expertly engineered, the Rolex Masterpiece lives up to its name.